On October 4th, Peter Plagens shared tales of his trajectory as artist and art critic, from Los Angeles to New York, and with several stops in between, from the 1970s to the present. The lecture, titled “Sunshine Musings: My Life in Art and Criticism” was made possible by an endowment by the Bonnie Cashin Foundation, Through images of his own work, personal snapshots, and other people's art, Plagens will trace his journey from college newspaper cartoonist to abstract expressionist artist and from Sunshine Muse to Newsweek. 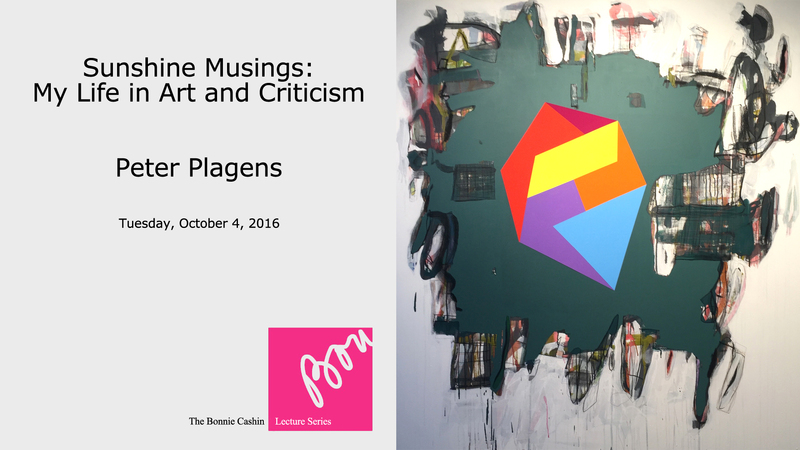 From his unique perspective as a painter, educator, art critic, and writer, Plagens will shed light on postwar art and culture in Los Angeles, reflect on the creative process, and relate how he ended up as "A Simple Country Painter" in New York by way of LA, Austin, and Brussels. A major influence on twentieth-century design, Bonnie Cashin (1908-2000) originated the credo “chic is where you find it” to express her belief that designers should possess a habit of wonder and an ability to connect the fashion world with objects and ideas not usually associated with it. In the spirit of making such connections, Cashin’s legacy to the UCLA Library includes the Bonnie Cashin Collection of Fashion, Theater, and Film Costume Design, 1913-2000, and the endowed Bonnie Cashin Lecture Series, bringing gifted individuals from varied disciplines to the UCLA Library to celebrate the creative process and preserve the legacy of Cashin’s remarkable life and work.